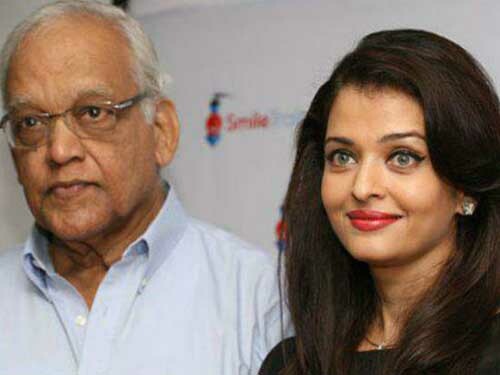 Popular Indian film actress and former beauty queen Aishwarya Rai's father Krishnaraj Rai passed away today after being ill. He was being treated at the Mumbai Lilavati Hospital for the last 2 weeks. He was kept in the ICU unit for treatment. Confirming the news, Dr.Ravishankar, Lilavati Hospital, said, "He was suffering from lymphoma cancer which spread to his brain. Today somewhere around 4pm he passed away. He was admitted 3 week back." As per one hospital staff "Aishwarya Rai Bachchan has been there constantly and managing Aaradhya and her father in hospital. Abhishek Bachchan too is present in the hospital and is being with Aishwarya throughout." This news had saddened the Actress Aish and the Bachan family. There are no announcement regardingt the funeral arrangements of Aishwarya Rai's father Krishnaraj Rai. It may take in Mumbai or in his native state by this week.